Again presenting pictures to inspire. 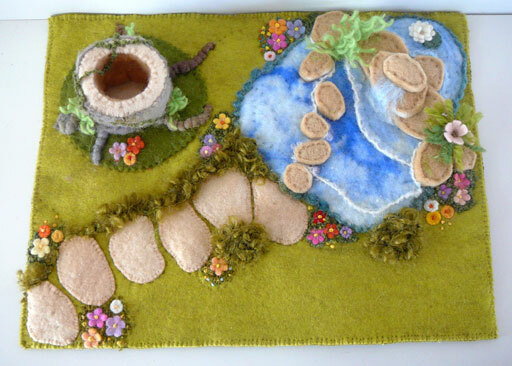 This time revealing a garden of delights that was sent to Sydney recently, and is a seasonal item or playmat reflecting Spring or Summer. Maybe it is a magical place. 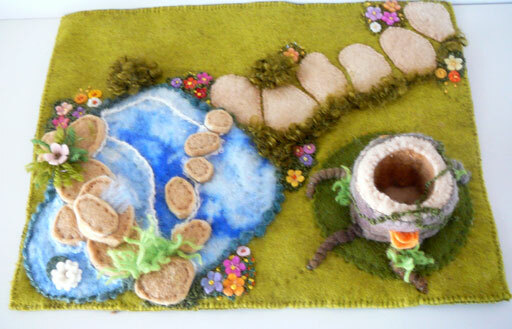 Or could it be the corner of a castle or place deep in a forest, a clearing or a glen. Is there a little house somewhere close by? A sugar house or a mushroom house or even …? Perhaps it is a park or someone’s much loved garden. And so the imagination takes flight and stories are there to discover. This is a very tactile piece inviting touch and connection. It has has been designed to be used and is suitable for younger children as all is well secured. It is a piece to give Beauty in play, and to encourage play as a vital component of learning, especially in early years, as Rudolf Steiner advocated. The tree trunk is hollow, a little place to use and to place objects inside, again to encourage interaction. There is a path to follow, a road to encourage an adventure as well as story telling. There is space to add objects . Initially I contemplated leaving the bushes and some other items free to move but then remembered how little bits get lost and create major dramas and lots of scattered, little bits can make for a big mess, leading to parental frustration. Hence there is a set scene but one that can be enhanced and gives room to personalize. Not only would this mat be useful for playing with but also as a prop for puppets. What came to mind instantly was that by that pond sits a princess who is surprised to find a little frog pop up from the water and ask for favour…….The tree stump and its hollow, just perfect for Alice in Wonderland to pop into as she follows that white rabbit. Now where does that road lead?Perhaps to a Secret Garden. Such beauty and so inviting.